Webster University has partnered with Eden Theological Seminary and The OASIS Institute, a leader in adult continuing education and volunteer programs, to create high-level learning opportunities for adults age 50+ in the Webster Groves community. Classes feature instructors from Eden, Webster and OASIS. Webster faculty members Chris Parr and Carrie Houk are among the scheduled instructors for two of the the OASIS program offerings at Eden this spring. Since 1982, OASIS has been a leader in adult continuing education and volunteer programs. Webster Groves, where Webster was founded in 1915, will be the newest St. Louis-area location for OASIS programs, with other sites in Clayton, Kirkwood, Chesterfield and O’Fallon, Missouri. 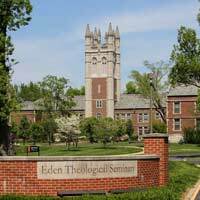 “In partnership with Eden Theological Seminary, Webster University is very glad to launch this new venture with OASIS, a longstanding and respected provider of programs to enrich lives and strengthen communities," said President Elizabeth (Beth) J. Stroble. "The offerings for spring provide rich opportunity to bring university and community members together for the purpose of lifelong learning. We value serving the community as a learning organization." OASIS has had numerous requests over the years for classes in Webster Groves. “We are delighted to partner with Webster University and Eden Seminary to bring extraordinary, high-quality learning experiences to older adults," said OASIS founder Marylen Mann. "It is so exciting for our members to have access to outstanding leaders in education. We are already seeing strong interest and enrollment in the programs." Religious Studies professor Chris Parr will present Religions as Maps of Reality: Making Sense of Religions in a World that's Full of Them on March 21 from 1-3 p.m. in Eden 405. Electronic/Photographic Media adjunct faculty member Carrie Houk Wilson will present Tennessee Williams: America's Shakespeare on April 12 from 10 a.m.-noon in Eden 404. Wilson currently serves as the artistic director of the Tennessee Williams St. Louis Theater Festival. Look for more involvement from Webster and Eden faculty members as the next batch of programming is developed for this summer.